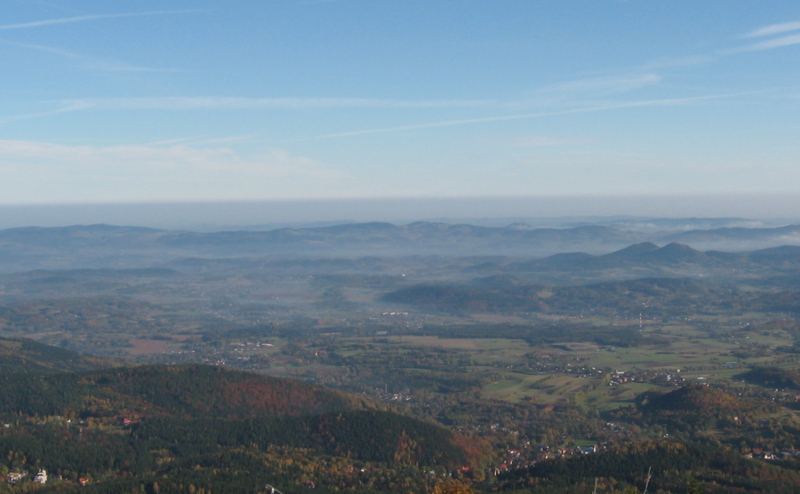 A pollutants trapped inside the subsidence inversion layer above Jeleniogórska basin in Sudety Mts (south west Poland). 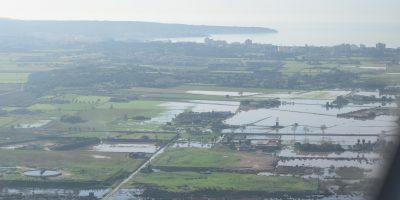 Should Mediterranean people be prepared for a tropical cyclone? People when checking the weather forecast usually focus on standard weather factors like temperature, pressure, wind, precipitation and cloud cover. There are the weather elements important in our day-to-day life unlike to another elements like dew point temperature, humidity, haze level, etc. In this article I would like to describe the importance of the haze in forming the weather conditions. Even when the Sun is shining and sky is blue someone (like me) can still complain on the weather because for instance visibility is not good. This weather factor is highly important for mountaineers, who want to see remote mountains. 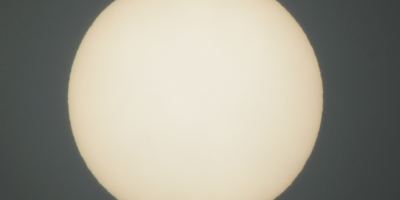 In another case the haze can disrupt astronomical observations. Poor visibility is also major problem for many applications of computer vision (Tan, 2008). 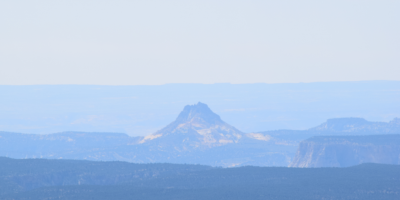 The visibility issue will be described in a separate article. Here whould consider an one basic factor, which causes a visual range impairment – the haze. The presence of haze in Earth’s troposphere influence appreciably both on sunlight and moonlight dispersing in your surroundings. Aside for the light scattering, sky colour changes and visibility impairment the haze has also an important influence on human health. This is one of the pivot issue, that I would like to cover in this part of the whole article. 1. WHAT IS THE HAZE? The haze is the atmospheric phenomenon, which extremely small, suspended in the atmosphere particles (lithometeors, hydrometeors) obscures the clarity of sky. Due to the extreme smallness of these particles, virtually smaller than the diameter of human hair (94% particles of the haze are below 2.5 micrometers in diameter – 30 times smaller than the width of human hair) are invisible to the naked eye. As I have mentioned haze consist of lithometeors and hydrometeors. Lithometors are a dry atmospheric suspensoids like volcanic ash, dust, sand and smoke. Hydrometeors consist of liquid or solid water particles. They may be suspended in the atmosphere or fall through the atmosphere. For hydrometeors we can classify: mist, kinds of fog, precipitation, dew, frost, rime and spouts. Both to lithometeors and hydrometeors we can classify the particles raised by wind from the Earth’s surface. Many of the weather elements identified as hydrometeors are formed by the condensation or sublimation of vater vapour in the air or on the surface. Here I will focus on the water droplets, that are suspended in the air. These water droplets determines the air humidity, which we can quantify in three different aspects, from which the most common is the relative humidity. The relative humidity says how much close is the air to being saturated. When relative humidity is bigger, then are better conditions to haze concentration through the coagulation or condensation of the smallish particles on water droplets. The coagulation of aerosol particles take place, when aerosols and droplets collide with each other. It results an aggregation and the particle size changes eventually (Pic. 1). Once humidity is bigger then the condensation of aerosol particles occurs. A smallish particles stick to the much bigger water droplet being suspended in the atmosphere (Pic. 1). Pic. 1 A behaviour of the haze particles depends on the level of humidity: 1 – coagulation of aerosol particles, 2 – condensation of aerosol particles (elte.prompt.hu). In dry air conditions haze tends to dissapear s long as normal conditions take place. The situation may be different for air polluted areas. The lifetime of the aerosol particles in the atmosphere is different. Basically it depends on their size and level, where are they currently suspended (Pic. 2). Pic. 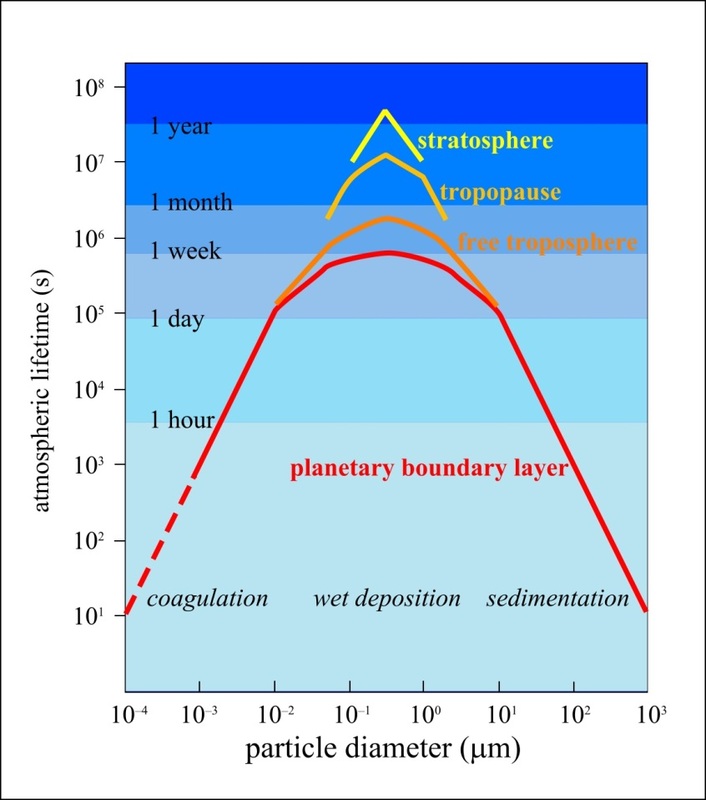 2 Atmospheric lifetime of different size particles at different levels of the Atmosphere (Jaenicke, 1980). We should remember, that not all lithometeors and hydrometeors can be classified as a haze, because haze is not precipitation, frost, dew, rime, fog and spout. Haze includes only the smallest particles as I wrote above. Haze can be generated also by air pollution (smog). That generated haze often occurs, when dust and smoke particles accumulates in relatively dry air. In the situation, when weather conditions block the dispersal of smoke and other pollutants they concentrate and form a usually low-hanging shroud, that impair the visibility. Resuming, haze has a diverse set of sources including extremely small particles of lithometeors and hydrometeors with also foliage exudations, combustion products and sea salt (Hidy, 1972). The particles produced by these sources respond quickly to changes in relative humidity and act as nuclei (centers) of small water droplets when the humidity is high. Haze particles are larger than air molecules but smaller than fog droplets (Nayar, Narasimhan, 1999). Layered haze, which are pollutants emitted into the atmosphere under stagnant or stable meteorological conditions (Malm, 2016). Regional haze, escalates recently due to increasing light pollution, where the smog layer spreads into another regions and sometimes even countries. A) Urban aerosol, which is dominated by antropogenic sources. The highest concentration take place during the air pollution episodes especially for the urban areas located in the basin. Highly concentrated particles are blocked by weather conditions and creates thick smog layer. Pic. 3 The chemical composition of the urban aerosols, where OC – organic carbon, EC – elementary carbon (Heitzenberg, 1994) (elte.prompt.hu). B) Marine aerosol, that constitutes one of the most important natural aerosol systems globally (O’Dowd, Leeuw, 2007). This type of aerosols is created by the interaction of wind stress at the sea or ocean surface. It incurs a bubble-bursting process typically resulting from whitecap generation, where sea-spray particles enslaves. When wind is stronger then marine aerosol is more dense. Moreover a strong wind can generate a spume droplet formations, that are bigger particles. Marine aerosol can exist in marine air masses. C) Rural continental aerosol is typical for rural areas with faint influence of air pollution. This type of aerosols has mainly natural origin, although recently is getting more influenced by fresh antropogenic emissions (mainly regional and long range transport). The natural aerosol sources contain around 30% primary biological material (Hock et all, 2008). Pic. 4 The chemical composition of the rural aerosols, where OC – organic carbon, EC – elementary carbon (Heitzenberg, 1994)(elte.prompt.hu). D) Remote continental aerosol is typical for continental air masses and inland regions. The air contains mainly dust, pollens and organic particles. Generally in this type lithometeors prevail due to mostly dry surface, that simplifies raising them by and wind from the ground. The sand particles are to be seen quite often. Pic. 5 The chemical composition of the remote continental aerosols, where OC – organic carbon, EC – elementary carbon (Heitzenberg, 1994)(elte.prompt.hu). F) Polar aerosols so-called “Arctic haze”, which was suggest to originate from antropogenic emissions in northern midlatituded (Pandis, Pandis, 2016). This type of aerosol increases in winter and early spring (February to April) each year (Pandis, Seinfeld, 2016). Aside for antropogenic substances this aerosol contains sea salt, dust and organic matter. G) Desert aerosol is a long-range transport type of aerosol with the biggest contribution of sand and dust. This type of aerosol has the biggest size of particles. Extremely dry area make favourable conditions to rising dust particles even by weak wind. In more windy conditions these particles are transported far, even on different continent. Pic. 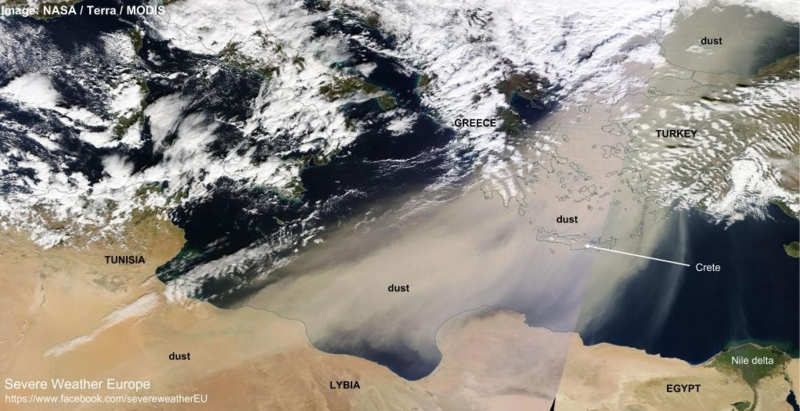 6 A good example of desert aerosols transported by wind from Sahara to South-East Europe (Severe Weather Europe). Pic. 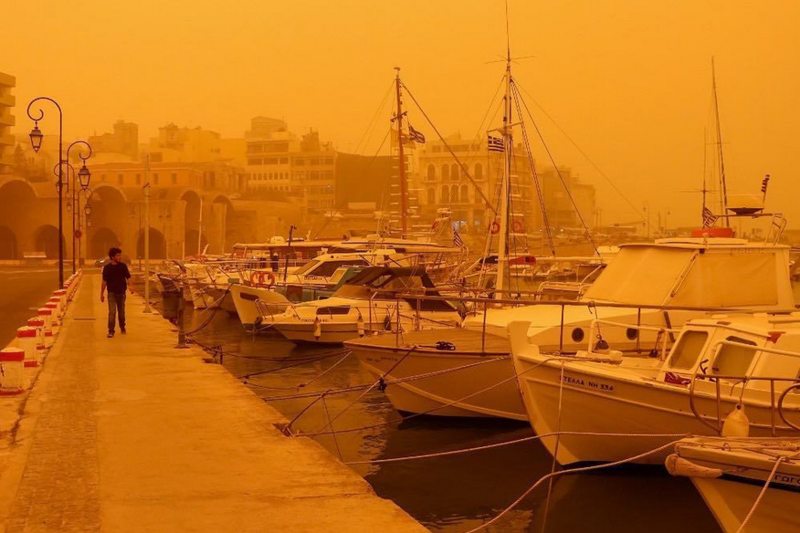 7 A dust storm in March 2018 at Heraklion in Crete, extremely high density of desert aerosols (forfun.com). Haze can cause a considerable impact on health especially in the polluted areas. 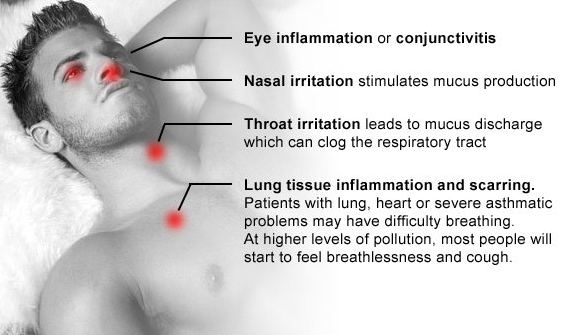 The most visible health deffect caused by air pollution includes difficulty in breathing, wheezing, caugh and asthma. In the next step it leads to worsening of existing respiratory and cardiac conditions. Due to extremely small size the haze particles can bypass normal body defence and penetrate deep to the lungs. When inhalated, they can enter to bloodstream and get absorbed by underlying tissue, potentially interacting with other compounds and substances in the body. We can distinguish a short-term and long-term haze effects. Short-term haze effects are to be observed just after the contact with polluted air. Depends how sensitive you are, the severity of the haze and the time of exposure you may experience some adverse short-term haze effects. First symptoms may be visible up to 1-3 days of time. People sometimes can not be aware, that their suffers can be associated with haze concentration. The aerosols can easily be inhalated into our lungs giving us a symptoms such as cough, wheezing, shortness of breath and a feeling of tiredness and weakness. Common can be also eye irritation or watering eyes. These symbols are usually mild and will subside when you stay indoor and limit your exposure to haze. During the dusty conditions we can be liable on asthma. Both dust and air pollution may cause irritation of the nose and throat in healthy individuals. Pic. 8 A short-term haze impact on human helath (blissair.com). Long-term exposure to the haze and particulate matter can lead to the development of medical conditions such a bronchitis and higher incidence of lung cancer. People can feel a headache, decreased lung function depressed respiratory immune defenses, chest pain sometimes also diarrhoea or stomach upset. Moreover stress and depression and insomnia. Long-term exposure to air pollution particles increase the risk of death by cardiovascular disease and reduce the live expectancy by several months to a few years. The long term haze effects on health we can consider for every period of human life. Yet in antenatal life when mother breathes toxic air the fetus can be threaten by underweight, chromosomal abnormalities and many defects, even death as well as in newborns. In China every 30 seconds a baby is born with some physical defects. The most common effects in order to frequency are: cleft lip, hearth disease and hydrocephalus. The amount of newborn defects caused by polluted air constantly increases both in urban and rural areas. In another group of age, for instance during the childhood and adolescence the air pollution can lead to diminished mental capacity and increased risk of brain damage. Polluted air has also negative effect on a central nervous system functionality. The air pollution can be outdoor and indoor. The outdoor air pollution is a really big problem for the most populated regions, mainly in Eastern Asia. The world’s most air polluted city is New Delhi, where 90% people is affected by pollutants. There are other places, where air pollution is big, like Jakarta, Kampala, central Iran, Peshawar and at least several others. Nowadays many air quality maps is available around the world to check the air quality in your area. One of the examples I would like to show below (Pic. 9, Pic. 10). Pic. 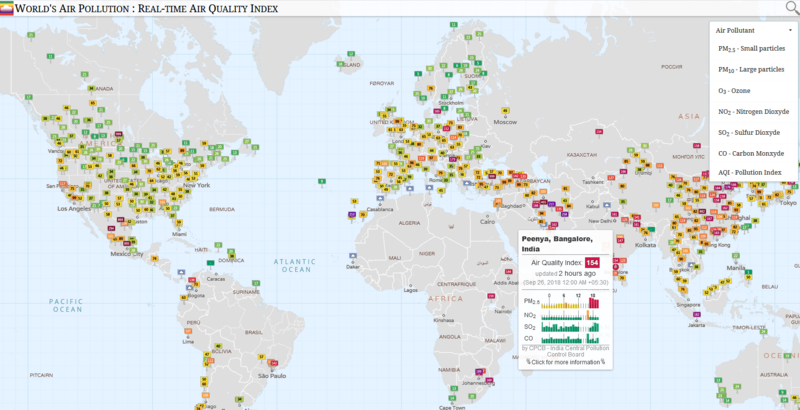 9 World’s real-time air quality index (waqi.info). Pic. 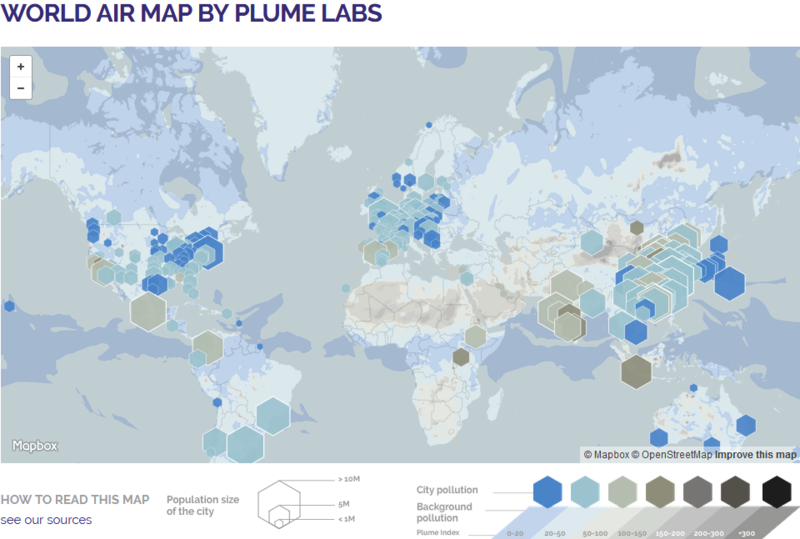 10 World air plume report (air.plumelabs.com). A multitude of air quality forecasts is also available for Android, but this is a topic for another article. Important is also indoor air pollution, that contains harmful chemicals coming from or accumulating inside the building. Best example of indoor air pollution we can find during the colder season. Heating a house by burning e.g wood and coal can contaminate the air inside the house. Ash and smoke can make breathing difficult and also stick to the walls and other objects in the house. Another culprit is the mold, caused by too big humidity inside the building. The spores of mold become a part of the air, being inhalated by human organism can cause sickness and alergy. Now we know what exactly causes the air pollution. We know also the regions, where the air pollution is the highest. It’s a good time to wonder how the air quality can be measured in our area. An Air Quality Index (AQI) is commonly used to indicate the amount of pollutants in the air over a specified period of time. 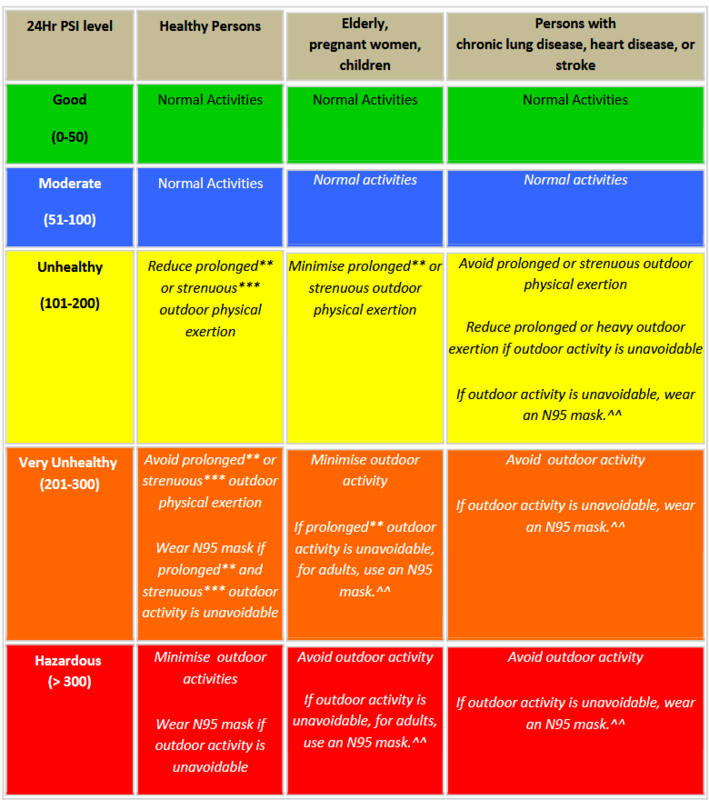 Air quality index values are usually grouped into ranges. Each range is assigned a description or severity, a color code and cautionary statement. Given an air quality index value you can get a general knowledge about the air quality in your area. Generally the severity of haze is determined by Pollutant Standard Index (PSI), which takes into account 6 air pollutants. Important is the 24 hour PSI, that is derived by taking the average of data collected from the past 24 hours and indicates the air quality impact on human health (Pic. 11). Pic. 11 The 24 hour PSI air quality index (RafflesMedicalGroup.com). Haze impact is negative not for humans only but also for a whole environment. Entire ecosystems suffer from a high level of air pollution. Haze can mufle sound and obscure shapes and colors. Haze can also directly contaminate the surface of bodies, water and soil. Haze is also a reason of acid rains, that kill the trees. Pic. 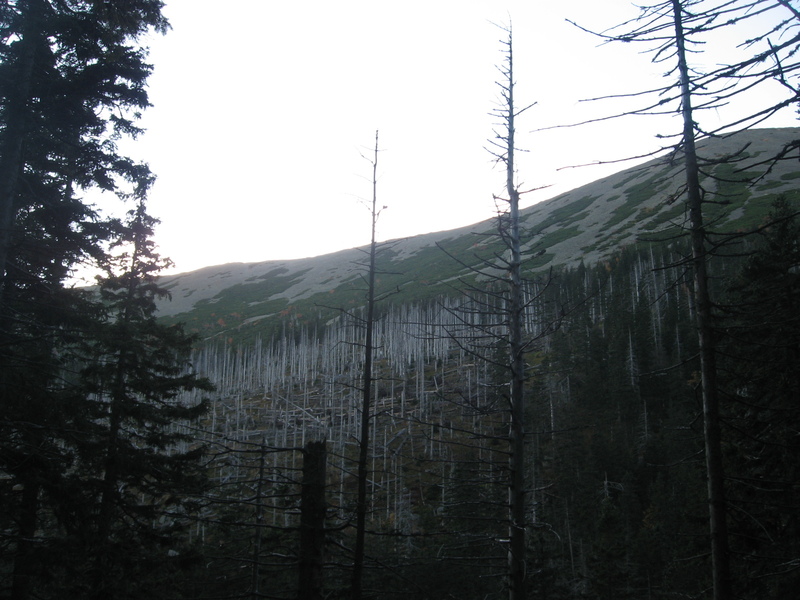 12 The forest destroyed by acid rain. Łomniczanka valley, Karkonoski National Park, Poland. The acid rain forms from mixture of water and oxygen in the atmosphere with sulfur dioxide and nitrogen oxide coming from coal-fired power plants and motor vehicles. Acid rain is killer not only for plants, but also for soils, changing its composition and also for buildings and monuments, because leads them to decay. Like humans animals are also exposed on air pollution, which causes lower reproductive rates, birth defects and diseases. Air pollution causes also global warming. Everyone can take steps to reduce air pollution. The idea is very simple. People should take a public transport rather than use their own cars, especially when they commute to work alone. Moreover cars should be superseeded by bikes. During the winter season people should resign with heating their houses by coal and start to use the gas. The smog combined with the thermal inversion can be really dangerous for people in any group of age. Another solution could be recycling a grass and yard trimming instead of burning them. Pic. 13 A air pollution seen above the Jeleniogórska Basin in Poland, which in this case is caused by using a coal and wood in heating the houses. If we have to live in area with high level of air pollution we should definitely prevent our airways and breath through a mask. 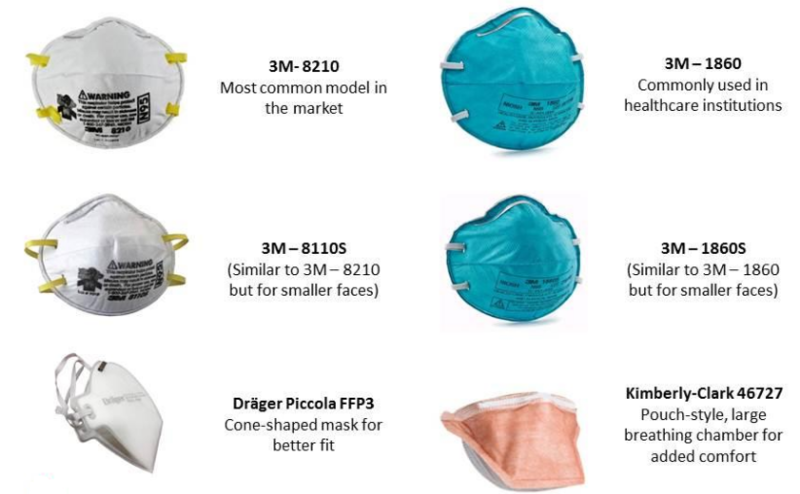 The best are N95 masks (Pic. 13). Pic. 14 N95 masks, which are at least 95% efficient against fine particles about 0.1 – 0.3 microns and 99,5% efficient against particles about 0.75 microns or larger (Moh.gov.sg). This is the first art of article, where I have described the haze impact on human life and environment shortly. Traditionally here is a lot of things, that possibly can be developed in future articles. Anyway I hope, that I have shown you the big imprtance of haze, about which probably you couldn’t realize before. Hidy G.M., 1972, Aerosols and atmospheric chemistry, Academic Press, New York. Hock N., et all., 2008, Rural continental aerosols properties and processes observed during the Hohenpeissenberg Aerosol Characterization Experiment (HAZE2002), (in:) Atmosphere, Chemistry, Physics vol.8, p.603-623. Jaenicke R., 1980, Atmospheric aerosol and climate, (in:) Aerosol Sciences, vol. 11, p. 577 – 588. Malm C., W., 2016, Visibility: The seeing of near and distant landscape features, Elsevier Inc., Oxford. Nayar K.S., Narasimhan G., 1999, Vision in bad weather, Columbia University, New York. O’Dowd C.D., Leeuw G., 2007, Marine aerosol production: a review of the current knowledge, (in:) Philosphicl transactions of the Royal Society. Sinclair D., Richard J., 1974, Effect of relative humidity on the size of atmospheric aerosol particles, (in:) Atmospheric Environment, vol. 8 i.11, p.1111 – 1117.